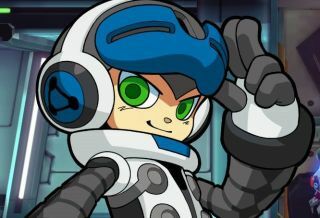 Deep Silver has released a new gameplay trailer for the Mega Man-inspired crowdfunding colossus Mighty No. 9, showcasing its new game modes and, perhaps more pertinently, reminding you that despite the myriad delays it's still happening and due out in February. The game modes in the video include Boss Rush, which pits Mighty No. 9 against all the other Mighties in back-to-back boss brawls, plus a Challenge Mode, a "One-Hit Death Maniac Mode," and online co-op and competitive challenges and races. Each of the non-standard modes was added to the game as a stretch goal, which the Mighty No. 9 Kickstarter easily surpassed on its way to more than $4 million in funding. Unfortunately, the second half of 2015 hasn't been the best for Mighty No. 9, which was scheduled for launch in September but ended up delayed—very awkwardly—to February 9, 2016. The demo made it out for September, though (although you can only get it if you're a backer) and creator Keiji Inafune promised last month that there will be no further delays.